In conjunction with the NBA's 50th Anniversary in 1996, the NBA named its 50 greatest players in history. Remarkably, 49 of the 50 players selected were alive and present (only Pete Maravich was deceased at the time) when they were honored as part of the 1996-1997 NBA All-Star Game festivities. A magnificent creation was unveiled during that event in the form of a series of limited edition lithographs measuring 39” wide by 25” high. The edition was limited to 250 individually numbered pieces, with the first 50 going directly to the players. 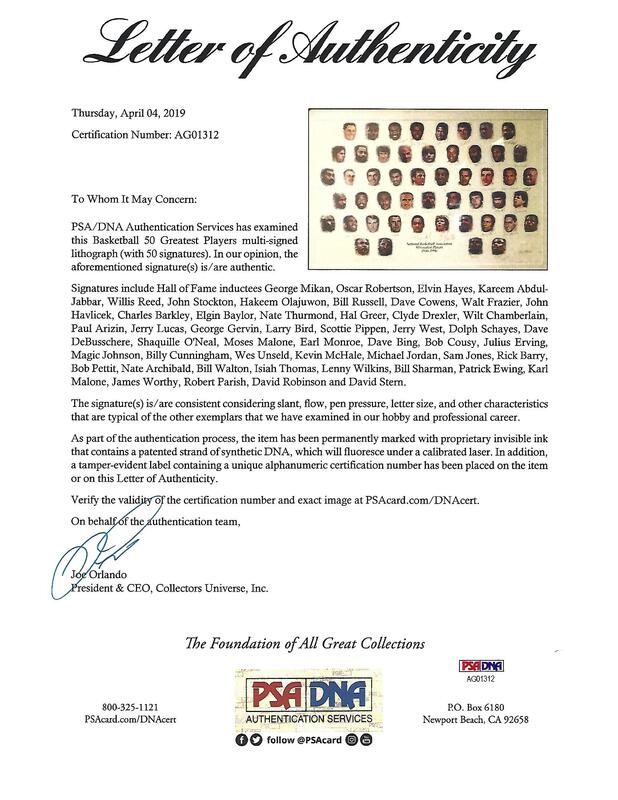 Many of the remaining 200 signed prints (100 "NBA Edition," 50 "Legends Edition," and 50 "Field of Dreams Edition") were distributed to league officials. 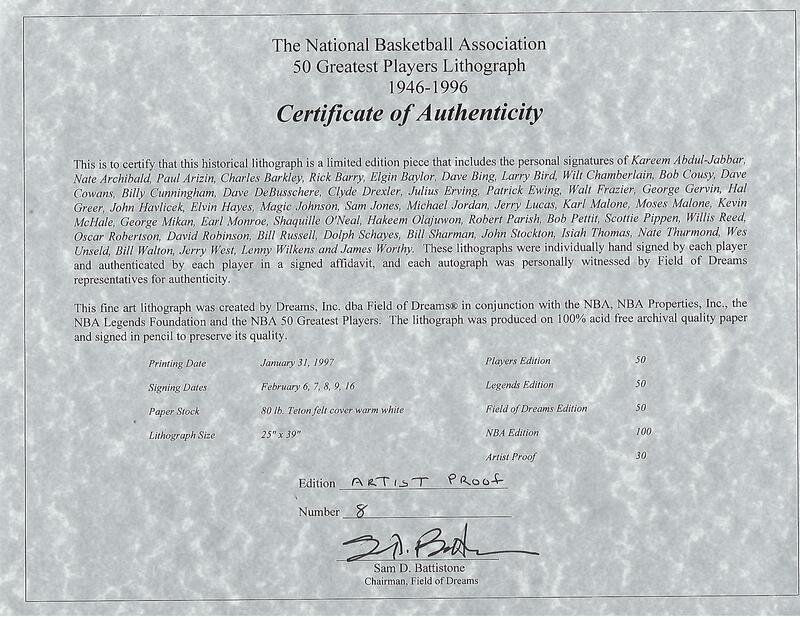 A special "Artist Proof" edition of 30 was produced under Field of Dreams founder and former Utah Jazz owner Sam Battistone. This is AP #8 of that edition. These incredible pieces, printed on the highest quality acid-free paper and bearing the likeness of each of the 50 greatest players as selected by the NBA, were created as a special keepsake and tribute to the selection of the sport's greatest stars of all time. Each player neatly signed the litho in pencil beneath his respective image. This unique NBA-sponsored project represents the most highly regarded, desirable, and important signed sports art print ever conceived. The NBA's "50 Greatest Players" is easily the most significant lithograph series ever created in any sport. The signed print is an enduring tribute to basketball history that will never be duplicated. It comes in a nice silver frame, ready for prominent wall display. COA from Sam Battistone. Full LOA from PSA/DNA.